Loneliness in older people is set to increase. Loneliness amongst over-50s is set to soar over the coming decades, a leading charity has warned. According to Age UK, the proportion of people aged over 50 who report feeling lonely "often" has remained relatively constant in recent years. However, with the numbers of over-50s set to increase thanks to an ageing population, the charity is warning of a hike in the number of older people suffering from loneliness. 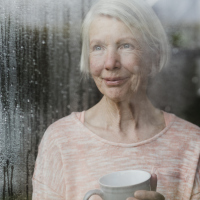 Age UK warn that loneliness can have severe implications on a person's health, particularly their mental health and wellbeing, and is urging the Government to implement a series of measures and strategies to help people who feel lonely. Based on population projections and current levels of people who report often feeling lonely, the charity estimates that the number of people aged 50 and over living in England who will often feel lonely will increase by half a million people by 2020/21. This will reach two million people by 2025/26. In 2016/17 the figure stood at 1.4 million. According to the charity's new report, Loneliness Amongst Older People, people aged 50 and over are more likely to be often lonely if they: have no one to open up to when they need to talk; are widowed; are in poor health; feel as if they do not belong in their neighbourhood; are unable do what they want or they live alone. For instance, a person who has been widowed can be five times more likely to suffer from loneliness compared with older people in a relationship, the charity said. "Our population is ageing quite fast and so we're heading towards having two million lonely over-50s in less than a decade, with serious knock-on consequences for their physical and mental health, and therefore for the NHS, unless we take action now," said Age UK's charity director Caroline Abrahams. "This is why the Government's forthcoming Loneliness Strategy is so timely and important: it needs to contain a raft of measures to prevent and address loneliness among people of all ages, plus enough resources so they can be implemented. "People suffering with chronic loneliness may well need one-to-one help on a sustained basis, so this must be factored into the Government's plan. "Age UK would also like to see a 'Loneliness Test' introduced for new Government policies, to make sure they don't unintentionally make the problem worse." If you're an older person and in the market for great value travel insurance designed specifically with seniors in mind, take a look at our guide to choosing the best senior travel insurance.